This course presents the information required to design a solar energy water heating system, after planning and system selection have been completed. Learn how to design and specify the collector, transport, storage and control sub-systems. This course is intended for mechanical engineers and other design and construction professionals interested in an introduction to the design of solar water heating systems. This course will give mechanical engineers and other design professionals an introduction to the systems, equipment, and materials of solar hot water heating systems needed for design. 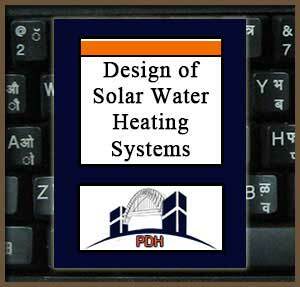 This is an introduction to the technology and design of solar hot water heating systems. This course will give you an introduction to solar hot water heating systems design. This course contains a disclaimer regarding the poor quality of some of the illustrations. Unfortunately, the quality is so bad on some figures that they are essentially unreadable.